We were thrilled with another proactive step towards a more sustainable environment in Malaysia Maritime industry. 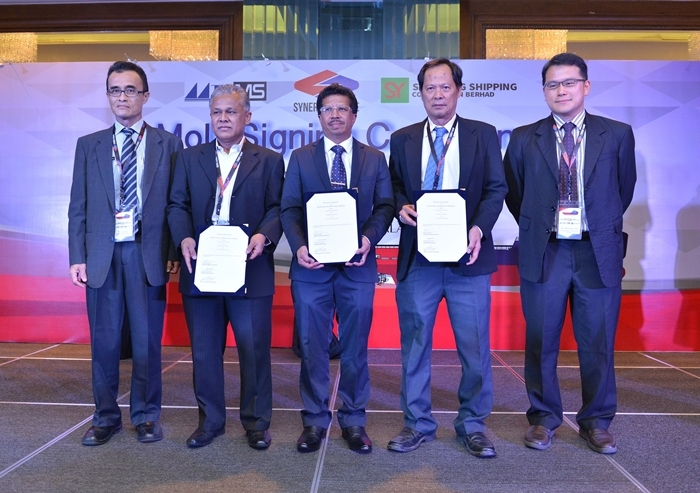 Recently Synergy Marine (M) Sdn Bhd joined forces with MTCMS Design Sdn Bhd and Shin Yang Shipping Corporation Berhad (through their subsidiary Shin Yang Shipyards Sdn Bhd) to design, build and deliver Malaysia’s first LNG-Powered Vessel Shipbuilding; set to revolutionize the Malaysian maritime sector and pioneer Green Technology Vessel. Not only is the vessel the first in Malaysia and across Asia, but also be the first to be built on Malaysian shores too. The MoU signinng ceremony was held at The Mandarin Oriental Hotel, Kuala Lumpur on the 14th of November, 2018 between the 3 companies namely Synergy Marine (M) Sdn Bhd, MTCMS and Shin Yang Shipyard Sdn Bhd for Malaysia’s first LNG-Powered Vessel Shipbuilding. In the nutshell, MTCMS Design Sdn Bhd has signed an agreement with Synergy Marine (M) Sdn Bhd to design Malaysia’s first LNG-powered Platform Supply Vessel (PSV). The vessel will be built by Shin Yang Shipyard Sdn Bhd in Malaysia. This will mark as one of the most advanced Offshore Support Vessels (OSV) being designed, built and operated by Malaysian companies. The design includes a digital twin for the PSV, complete with Virtual Reality Technology for maintenance and training. Synergy Marine has invested in research and development for the evolution in ship design to the most advanced and high technology in 3D, which include Digital Twin Technology for the new vessel, complete with virtual reality technology for maintenance, safety drills, and training purpose. Besides this, we also have an overview of the new vessel, measured at a length of 76.8 meters, breadth 19 meters, a deck capacity of 600 square meters, equipped with dual fuel engine system that is LNG and diesel fuel, this collaboration proved to be a significant milestone between Synergy Marine, MTCMS Design Sdn Bhd and Shin Yang Shipping Corporation Berhad, with developments in both High Technology and Green Technology. The timeline of keel laying will be in January 2019 and expecting to be completed by the fourth quarter of year 2020. After completion, this vessel would be available for contract charter from any Oil & Gas contractors and she will be used in particular for operations in the global market. The vessel is ready to carry considerable amount of cargoes in her tanks including fuel oil, liquid mud, fresh water, dry bulk and drill water and a large deck space. According to Dato’ Roslan Ahmad, with this vessel Synergy Marine intends to service various global Oil & Gas companies who will reap the benefits of this illustrious vessel that not only complies to IMO regulation, but with the adoption of Green and High Technology vessel in their Oil & Gas operations, this vessel will save the fuel consumption in any Oil & Gas operations.